Hale S. Irwin (born June 3, 1945) is an American professional golfer. He was one of the world's leading golfers from the mid-1970s to the mid-1980s. He is one of the few players in history to win three U.S. Opens, becoming the oldest ever U.S. Open champion in 1990 at the age of 45. As a senior golfer, Irwin ranks first all-time in PGA Tour Champions victories. Along with Gary Player, David Graham, Bernhard Langer and Justin Rose, Irwin is one of five golfers to win official tournaments on all six continents on which golf is played. He has also developed a career as a golf course architect. Irwin was born in Joplin, Missouri, and raised in Baxter Springs, Kansas and Boulder, Colorado. His father introduced him to the game of golf when he was 4 years old. He broke 70 for the first time at the age of 14. Irwin was a star athlete in football, baseball, and golf at Boulder High School and graduated in 1963. Irwin then attended the University of Colorado, where he was a two-time All-Big Eight defensive back, as well as an academic All-American in football. He won the individual NCAA Division I Championship in golf in his senior year in 1967 and turned professional the following year. Irwin had 20 victories on the PGA Tour beginning with the 1971 Sea Pines Heritage Classic and finishing with the 1994 MCI Heritage Golf Classic, and won prize money of just under six million dollars. His 1994 Heritage win at the age of nearly 49 made him one of the oldest winners in Tour history. Irwin's tournament victories kept him ranked high among his peers - he was ranked among the top five in McCormack's World Golf Rankings in every year from 1975 to 1979, inclusive. He ranked in the top-10 of the Official World Golf Rankings for a few weeks in 1991. Irwin's first U.S. Open triumph came at Winged Foot in 1974 at the age of 29. In what became known as "The Massacre at Winged Foot", Irwin won with a score of 7-over par, the second-highest winning score in relation to par of any U.S. Open since 1945. The course conditions at Winged Foot in 1974 were described as "brutal". Johnny Miller and several other players suggested that the USGA had intentionally made the Winged Foot course setup particularly treacherous in response to Miller's record-breaking round of 63 at Oakmont the year before. Irwin, however, said in 1974: "I've always enjoyed playing tough courses. It's much more of a challenge to me." Irwin earned $35,000 for his victory at Winged Foot and said that he had a vivid dream three weeks earlier that he won the U.S. Open, which he only told his wife about. Irwin won the Piccadilly World Match Play Championship at Wentworth Club in 1974 and 1975. He missed out on a record-breaking third straight victory when he was beaten in the 1976 final by Australian David Graham on the second sudden-death playoff hole. Between 1974 and 1977, Irwin had four consecutive top-5 finishes at The Masters. In 1977, Irwin's three wins on the PGA Tour included a five shot victory in the Colgate Hall of Fame Classic at Pinehurst Resort. Irwin shot a second round of 62 at Pinehurst for a 15-under par opening 36-hole total of 127, which was the best in any PGA Tour event for over a decade. Between January 1975 to the end of the 1978 season, Irwin made the cut in 86 consecutive PGA Tour events. To date, this is the fourth longest streak of consecutive cuts made on the PGA Tour, behind Tiger Woods (142), Byron Nelson (113) and Jack Nicklaus (105). Irwin added a second U.S. Open title in 1979 at Inverness Club. With its narrow fairways and heavy rough, the Inverness course was a stern test for the players. Irwin's final round of 75 tied the post-World War II tournament record for the highest final round score by a U.S. Open champion. The next month in The Open Championship at Royal Lytham & St Annes, Irwin came to the final round with a two-shot lead. He was bidding to become only the third golfer since 1945 to win the U.S. Open and The Open Championship in the same year after Ben Hogan (1953) and Lee Trevino (1971) - a feat later matched by Tom Watson (1982) and Tiger Woods (2000). Irwin said in 1979: "I would dearly love to win the British Open. It is special." However, he was thwarted in his attempt at an historic double by the incredible recovery play of Seve Ballesteros. In 1983, Irwin had another close tilt at The Open Championship, but lost by a shot to Tom Watson at Royal Birkdale, after whiffing on a tiny putt of about an inch, during his third round of play. Irwin said that his mistake, which cost him the chance of a playoff with Watson, was "a mental lapse" and that he learned a lesson from it, later being very careful on short putts. 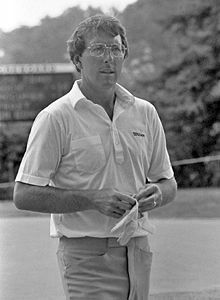 Irwin said in an interview in 2000 that the greatest disappointment of his career was not at the British Open, but at the 1984 U.S. Open at Winged Foot. Irwin had led the tournament after the first three rounds, but shot a final round of 79 to finish 6th. Reflecting on his final round collapse, Irwin said: "A number of factors were in play and it was very emotional. I thought it would be great to win 10 years later at the same venue and, more than anything else, my father was dying of cancer then and I thought it would be wonderful to give him a victory. I destroyed myself with the pressures I'd built up." After his victory in the 1985 Memorial Tournament, Irwin had occasional top-10 finishes in tournaments for the rest of the 1980s, but he did not have a further official PGA Tour win until an incredible year in 1990, which was capped by his third U.S. Open victory. In a remarkable tournament, Irwin holed an improbable 45-foot (14 m) birdie putt on the 72nd hole to join a playoff against fellow American Mike Donald. In the 18-hole Monday playoff, Donald was two shots ahead of Irwin with three holes to play. Donald missed a 15-foot par putt on the 18th which would have given him victory. Both men shot rounds of 74 in the playoff and Irwin won the title with a birdie on the first sudden-death playoff hole. After becoming the oldest ever U.S. Open champion at the age of 45, winning his first PGA Tour event for five years, Irwin was gracious in victory. He said of his playoff opponent Mike Donald: "God bless him. I almost wish he had won." Somewhat remarkably, after his 1990 U.S. Open triumph Irwin won the Buick Classic the following week, becoming the first man since Billy Casper in 1966 to win a PGA Tour event the week after gaining the U.S. Open title. During his career, Irwin won professional tournaments on all six continents on which golf is played: Africa, Australia, Asia, Europe, North America and South America. Irwin played on five Ryder Cup teams: 1975, 1977, 1979, 1981, and 1991. He was inducted into the World Golf Hall of Fame in 1992. Former U.S. Open champion and television analyst Ken Venturi said of Irwin: "Aesthetically and technically, Hale stands at the ball as well as any player I've ever seen." Irwin qualified to play on the over-50 Senior PGA Tour (now Champions Tour) in 1995, and enjoyed even greater success at this level than he did on the PGA Tour. Through the 2014 season, he is the career leader in wins and earnings with 45 victories and over $26 million. Irwin won three consecutive PGA Seniors' Championships between 1996 and 1998, including a 12-stroke victory in the 1997 tournament, which was the largest ever margin of victory in a 72-hole Champions Tour event until Bernhard Langer's 13-stroke victory in the 2014 Senior Open Championship. Irwin's nine victories in 1997 tied the Senior Tour record set by Peter Thomson in 1985. Irwin won the U.S. Senior Open in 1998 and 2000 for a career total of five USGA titles. He narrowly missed out on a third U.S. Senior Open title in 2004 when he finished one stroke behind Peter Jacobsen. Irwin is the oldest player to finish in the top five in a senior major, with a third-place finish at the 2012 Senior PGA Championship at the age of 66. In the 2012 3M Championship, Irwin shot a score under his age for the first time in his career. His round of 65 included an eagle on the 9th hole and six consecutive birdies on the back nine. In 2000, Irwin was ranked as the 19th greatest golfer of all time by Golf Digest magazine. Irwin is married to wife Sally and has two children. Irwin's son Steve qualified for the 2011 U.S. Open. Steve Irwin said of his father: "I'm very proud of him. The U.S. Open is what truly defined his career. It's been my ultimate goal in golf to play in the U.S. Open since I began competing." For 25 years, Hale Irwin helped to raise money for the St. Louis Children's Hospital, which named a wing in his honor. Irwin also enjoys hunting and fishing and spending time with his grandchildren. He is the uncle of former CU lineman Heath Irwin. Senior majors are shown in bold. 1Defeated Mike Donald with a birdie on the 19th hole after they were tied at 74 (+2) in an 18-hole playoff. The Senior British Open was not a senior major until 2003. This list may be incomplete. ^ "PGA Tour Media Guide". Retrieved January 2, 2013. ^ "Biography". Hale Irwin.com. Retrieved August 7, 2012. ^ "69 Players Who Have Reached The Top-10 In World Ranking" (PDF). Retrieved January 2, 2013. ^ "1974 U.S. Open Golf Tournament". Golf.about.com. Retrieved December 29, 2012. ^ Potter, Jerry (June 14, 2006). "Players were pushed in 1974 U.S. Open at Winged Foot". USA Today. Retrieved December 29, 2012. ^ Loomis, Tom (June 14, 1974). "Winged Foot Irwin's Type Of Course". Toledo Blade. Retrieved January 2, 2013. ^ Johnson, Chuck (June 17, 1974). "No Mistake, Irwin Wins US Open". The Milwaukee Journal. Retrieved January 2, 2013. ^ "Graham beats Irwin". Eugene Register-Guard. October 10, 1976. Retrieved January 2, 2013. ^ "Irwin fires 62 leads by five at 127 score". Montreal Gazette. AP. August 27, 1977. Retrieved January 2, 2013. ^ "PGA Tour Records - Most Consecutive Cuts Made - Longest Cut Streaks". Golf.about.com. Retrieved December 29, 2012. ^ "Inverness Club". Linksmagazine.com. September 14, 2012. Archived from the original on March 5, 2016. Retrieved December 29, 2012. ^ "U.S. Open Records". USGA. Retrieved December 29, 2012. ^ "Webb Simpson could miss British Open as he awaits birth of his second child". PGA of America. Retrieved December 29, 2012. ^ "Hale Irwin Keeps An Open Mind". Evening Independent. St. Petersburg, Florida. AP. July 20, 1979. Retrieved January 2, 2013. ^ Dorman, Larry (July 18, 1983). "One-inch stroke of misfortune costs Irwin chance for playoff". Reading Eagle. Reading, Pennsylvania. p. 18. Retrieved January 2, 2013. ^ a b Berry, Jack. "Q & A with Hale Irwin". Michigan Golfer. Retrieved December 29, 2012. ^ "Irwin wins U.S. Open sudden-death playoff". The Daily Reporter. Spencer, Iowa. AP. June 19, 1990. p. 9. Retrieved January 2, 2013. ^ Yannis, Alex (June 25, 1990). "Irwin Is Planning To Take a Break". The New York Times. Retrieved December 29, 2012. ^ "Top Tens: Champions that failed to master Augusta". ESPN. April 6, 2012. Retrieved December 29, 2012. ^ "Career Victories". Champions Tour. Retrieved November 29, 2014. ^ "Champions Career Money Leaders". Champions Tour. Retrieved November 29, 2014. ^ "Champions Tour All-Time Records". Best Courses. December 13, 2011. Retrieved December 29, 2012. ^ "Off-Course Kite Benefits Jacobsen". Los Angeles Times. August 2, 2004. Retrieved April 6, 2013. ^ "Ageless Irwin still sees room for improvement". PGA of America. February 13, 2009. Retrieved December 29, 2012. ^ Stensaas, Brian (August 6, 2012). "Irwin shoots under his age in final round of 3M Championship". Star Tribune. Retrieved January 19, 2012. ^ Yocom, Guy (July 2000). "50 Greatest Golfers of All Time: And What They Taught Us". Golf Digest. Retrieved December 5, 2007. ^ "Hale Irwin - Player Profile". Golfing-weekly.com. Retrieved December 29, 2012. ^ O'Neill, Dan (June 14, 2011). "Another Irwin will tee off at U.S. Open". St. Louis Post-Dispatch. Retrieved December 29, 2012. ^ Price, Terry (August 1, 1998). "Brothers Enjoying Reunion". Hartford Courant. Retrieved January 2, 2013.